A new study also ID’ed eight objects that could have come from beyond our solar system. About 70,000 years ago, around the time our ancestors were just beginning to leave Africa, a small red dwarf star passed remarkably close to the solar system. Scholz’s star came within a light-year of the sun, the closest such encounter we know of. Today, Scholz’s star sits about 20 light-years away, its stellar flyby a distant memory. But we are still seeing the influence of its visit. Back in 2015, researchers led by Eric Mamajek, professor of astronomy and physics at the University of Rochester, studied the galactic orbits of Scholz’s star and our sun. They discovered that Scholz’s star and its brown dwarf binary companion probably wandered close to our solar system. At the time, the scientists concluded that Scholz’s star did not disturb the orbits of any objects in the solar system in any notable way when it passed by. The new study, conducted by researchers at the Complutense University of Madrid and the University of Cambridge, analyzed the positions and velocities of 339 hyperbolic objects in the solar system. Normally, you’d expect the distribution of these objects across the sky to be more or less even. However, a group of them seem to be coming from the same radiant, or point of origin in the sky, and that area aligns with the encounter with Scholz’s star. Any objects that might have been pushed by Scholz’s star 70,000 years ago would only now be approaching the inner solar system. The study identifies an exciting connection between these comets and the estimated location of the Scholz’s star flyby, but to truly confirm that the hyperbolic objects were pushed by that star in prehistoric times, additional modelling of both the comets and the star will be needed. By analyzing the 339 hyperbolic objects, however, the team turned up another tantalizing find—possible interstellar objects. In addition to the comets that could have been hurled in by Scholz’s star, the study found eight objects that may be new interstellar candidates. The only confirmed object from outside the solar system to visit our neighborhood of planets is ‘Oumuamua, an elongated asteroid that made a close pass to Earth in October 2017. These additional eight objects are icy hyperbolic bodies with a velocity of 1.5 km/s or more, suggesting they could be interstellar comets. If any of these objects are confirmed as interstellar interlopers, it would provide an icy comet from beyond the solar system to study alongside the rocky asteroid ‘Oumuamua, which turned out to be an object unlike anything astronomers had ever seen. Most astronomers believe interstellar objects fly through the solar system regularly, and our telescope survey projects are advancing toward the point of finding them much more frequently. 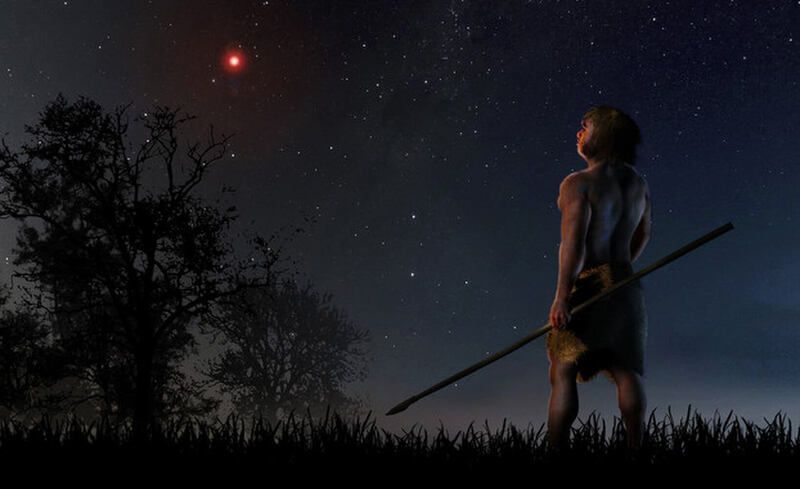 When the red dwarf star and its brown dwarf companion flew by the outer reaches of the solar system, it is possible that humanity’s ancestors saw the star in the sky. Scholz’s star was almost certainly not visible generally, but red dwarfs can periodically flare up due to magnetic activity and grow many times brighter than their standard magnitude. The dimmest stars humans can see with the naked eye have an apparent magnitude (intrinsic magnitude modified by distance) of about 6 (lower numbers are brighter). If Scholz’s star was on the farther end of estimates, it would have had an apparent magnitude of about 11, and closer in an apparent magnitude of perhaps 7.9. It is tempting to imagine that prehistoric humans looked up one night to catch a glimpse of Scholz’s star flaring up in the sky. Perhaps they considered it a sign of a bountiful hunt, or an omen of doom. Seventy thousand years later, equipped with all the advantages of modern science, we may have found new evidence of Scholz’s visit to the solar system, sending the most distant comets of the Oort cloud in for a closer look.